They call it an obesity epidemic. According to the CDC, 37.9% of American adults are now considered obese. If you also include overweight people in this category, the number becomes a whopping 70.7%. It’s not even just a North American problem. According to a recent analysis published in journal The Lancet, 30% of the world’s population is now overweight or obese. Many struggle each day to change their diet and exercise habits to encourage the loss of pounds. Why is it so difficult to keep weight off nowadays? We all know the typical culprits: a more sedentary lifestyle that causes us to burn fewer calories each day, long work hours that don’t allow for the preparation of fresh and healthy meals, combined with a ubiquity of fast and convenient food choices which are high in fat, sugar, or both. However, a recent study suggests there may be another, more insidious cause which we can do little to combat: hormone-altering chemicals in our environment. According to a study published recently in the journal PLOS, oil and water-repelling chemicals commonly used in fast-food wrappers, non-stick pans, stain resistant fabrics and carpets, clothing, and some cosmetics are now being associated with unexplained weight gain. In this study, 621 overweight or obese men and women were followed for two years as they were put on energy restricted diets. On average, the participants lost 14 lbs during the initial 6 months of the study, but many regained the weight during the rest of the study. 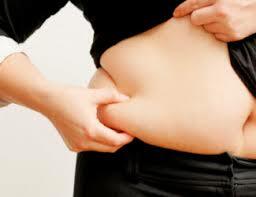 It’s not uncommon for people to regain the weight they initially lose while on a diet. However, researchers found that those who gained back the most weight also had the highest amount of PFAs (perfluoroalkyl substances) in their bloodstream. PFAs have already gained a reputation among scientists as “obesogens”, but this is the first time their fat-generating capabilities have been seen in a human study. The weight gain was due to a lowered metabolic rate, and it’s not yet clear if the extra PFAs caused this lowered metabolic rate, or if the reduced metabolic rate allowed the PFAs to accumulate. Whatever the case, the correlation is disturbing. It means that we may have less control over our ability to lose weight than we thought. Unfortunately, these PFAs are so prevalent in our environment that it’s virtually impossible to avoid them. They also take a long time to break down, so once they’re there, it’s very hard to get rid of them. Luckily, the liver is a filtration organ with an amazing ability to break down and remove chemicals and other toxins from our bodies. Therefore, keeping your liver in the best health possible should help. We have had many customers tell us of their sudden ability to lose weight once their liver was well cleansed, and it could be due to increased breakdown and removal of these PFAs from the body. If you are interested in doing some liver and gallbladder cleansing, please contact us for more details. In an increasingly chemical-laden world, it appears to be our best option for maintaining optimal metabolic health.